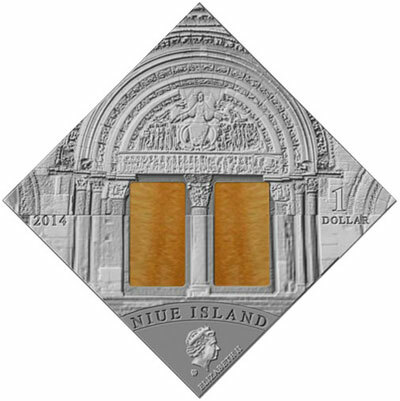 The Treasury of the Island of Niue have launched the first coin in an eight coin series which will focus on varying styles and significant periods of European art which has influenced our world. This issue features Romanesque Art and its focus for highlighting this period is the Benedictine abbey church of St. Marie-Madeleine or as it is sometimes referred to, the Basilica of St. Mary Magdalene. With its complex sculpted capitals and portals, it is one of the most outstanding masterpieces of Burgundian Romanesque art and architecture. Thought to have originated about the year 1050 by the monks of Vézelay who claimed to hold the relics of Mary Magdalene, Vézelay had become an important place of pilgrimage for the Catholic faithful. To accommodate the influx of pilgrims a new abbey church was begun, dedicated on April 21, 1104, but the expense of building so increased the tax burden in the abbey’s parish that the peasants rose up and killed the Abbot. The number of pilgrims in later years was such that an extended narthex or, an enclosed porch was built and inaugurated by Pope Innocent II in 1132 to accommodate the faithful. The nave – which had burned down once before with a great loss of life, burned down once again in 1165 after which, it was rebuilt in its present form. The Basilica of St. Mary Magdalene is today a UNESCO World Heritage Site. Struck by the Mint of Poland on behalf of the Treasury of Niue, the coin is designed by Robert Kotowicz who has accommodated the design to a square or diamond shape. The reverse includes an earlier depiction of the extraordinary carvings above the central portal leading to the nave of the Basilica, the doorway on the coin is decorated with inlays of agate. 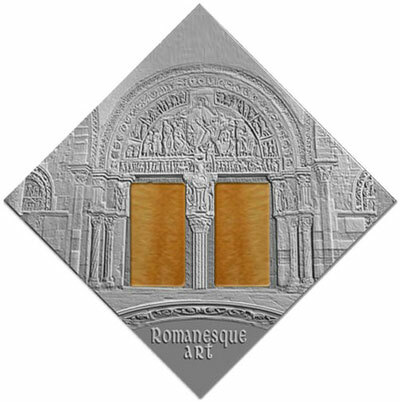 Below the primary design is the text “ROMANESQUE ART”. The obverse cleverly shows a later renovated version of these magnificent carvings, also with the agate inlays in the doorway. A miniature portrait of HM Queen Elizabeth II is placed just below the doorway and the text “NIUE ISLAND” is seen just above the portrait. The year “2014” is placed to the left corner of the coin and the coin’s denomination of “$1” is on the right side. This coin is the first issue in an eight coin collection in total. The other styles or periods of European to be featured and / or included are Gothic, Renaissance, Mannerism, Baroque, Rococo, Classicism and Romanticism. An elegant custom presentation case with transparent lid is available to display the complete collection. The Mint of Poland – on behalf of the Treasury of the Island of Niue plan a new issue in the series at the rate of one coin per month. For more information on this and other coins available from Niue, please visit the Mint of Poland’s retail shop at: http://www.skarbiecmennicy.pl/sztuka-ktora-zmienila-swiat-kolekcja.html Information offered in Polish – Only orders within Poland can currently be dispatched. How come Niue silver commemorative coin is oxidized? So what kind of silver oxide and what kind of agate used for this coin? I think this process was used on this series to highlight or feature the artistic designs on the coins. From what has been told to me about the series, there will be different semiprecious minerals or stones used on the coins, different colours to co-ordinate with the different art featured.